Today, I’m delighted to present to you a recent interview I did with mythological fantasy author Coreena McBurnie. She interviewed me on her blog a few days ago, so today, I get to return the favor. Coreena is also interested in appearing on the weekly podcast, so watch for those details soon. But without further ado, read on below for further details on how she successfully turned a Greek myth with controversial content into a young adult novel, what she wished she’d have known before starting her author’s journey, and where she’d go if she could time travel for one day. How did your book come to be? I have always had a great love of ancient Greek mythology and studied Classics in university. While there I read the Oedipus plays by Sophocles. I was immediately taken with Antigone, Oedipus’ daughter — she’s strong, stands up for herself, and does what she thinks is right even in the face of death. 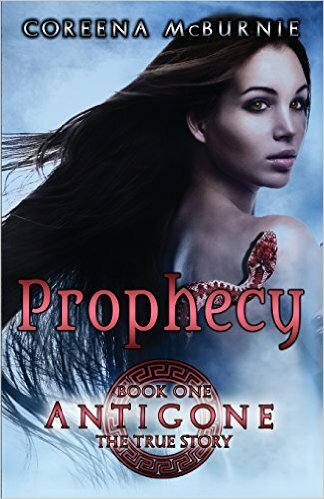 When I was looking for a novel idea several years ago (because I was participating in National Novel Writing Month — a challenge to write a novel in November), I thought it would be fun to write about Antigone. I wasn’t sure how to go about it, especially as a young adult novel because some of the subject matter is delicate (i.e., she’s the child of an incestuous relationship), but finally decided just to tackle the story head on and not to make any apologies for what is the in the myth. Once I did that, Antigone found her voice very quickly. What’s it like to tell other people you’ve written a book? It’s an interesting thing, this sharing of a story that is a part of you, but then it’s out there for the world to see and critique. I’m quite an introverted person, so I actually don’t bring it up much. I get really nervous when I tell people, but so far, everyone is very supportive and happy for me. If you could share a meal with any of your characters, who’d it be and why? Antigone. I think she’s fun and amazing. And how great would it be to participate in an ancient Greek feast? I love the ancient Greek and Roman stories and they inspire a lot of my writing. My favourite book is probably Homer’s Odyssey. Growing up I loved CS Lewis’ The Lion, The Witch, and the Wardrobe series, along with anything by Agatha Christie or Douglas Adams. Recently, I’ve read Kristin Cashore’s Graceling series, Neil Gaiman, Rick Riordan, Eoin Colfer… One of the things I’ve really been enjoying is reading so many new and innovative indie authors. Hobbies… Well, I love to read and I’m trying to learn to paint a bit, though this is more of a creative exploration than a mastery thing. I enjoy being outside around trees or water. I also have three kids, so is taxi driver considered a hobby? And recently I’ve become addicted to Supernatural on Netflix. How do you find readers for your books (i.e. your audience)? Friends? Family? Social media contacts? Local library? …? This is my first published book, so I am still working on that. Family and friends are definitely my first readers. I’m having a book launch party in a couple of weeks, which hopefully will attract some attention where I live, and I’ve donated a copy to my local library. I’m also working on social media by reaching out to book bloggers who might be interested in reading my book and offering them review copies. So far, all of this is slow, but building (I hope). What’s one (doesn’t have to be just one) thing you wish you could have told your pre-published author self? Get beta readers sooner. I spent a lot of time editing and perfecting things, just to have the beta readers point out changes that needed to be made, and then I had to change everything again. Your spirit animal is _____ and why. A black jaguar — I dream about them a lot and love the protective, shadow qualities of a jaguar, especially a mother. When I am stressed out, I imagine a black jaguar looking out for me. I know it’s strange, but there you are. Really not my thing, they’re kind of creepy. You see your book being sold on ebay. You are ______ (fill in the blank). Happy. Someone read my book and thinks it has enough value to resell it. Now maybe someone new will read it, someone who might not have otherwise found my book. Flying. I would love to see the world from high up, like birds. There is also a certain freedom to flying that is enticing, being able to go anywhere, any time. Now imagine you’re a time traveler for a day. Where and when would you go? To Alexandria right before they burned the library and find a way to stop that somehow. Can you imagine what was lost there? Thanks, Coreena, for joining us today! Congratulations on your debut book and wish it the world of success. Looking forward to having you on the podcast! Signup for the mailing list for a free special edition podcast and a demo copy ofThe Thirteenth Hour! Thanks for having me on your blog, Joshua!